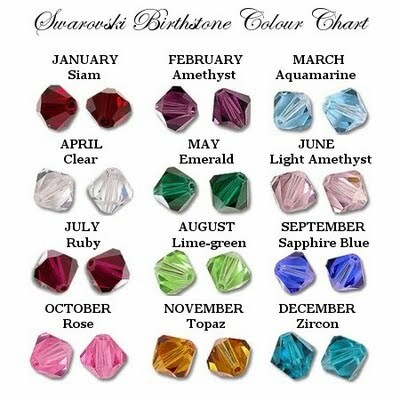 Erika Price Handcrafted Artisan Jewellery: What Is Your Birthstone? 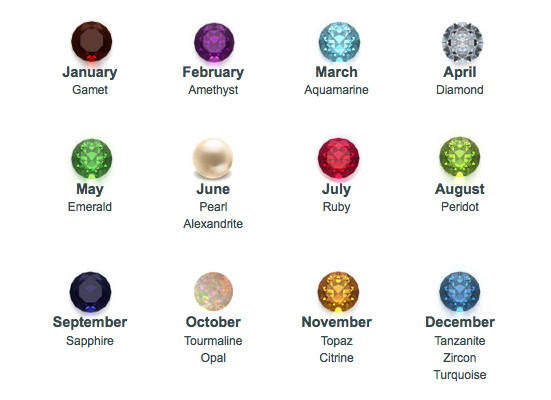 Do you know what your birthstone is? I thought I did until I looked further into it, and discovered that birthstones can be determined by the day of the week you were born on, the calendar month you were born, the Zodiac sign for the month you were born, the time and place of your birth, Chakras and even Lunar calendars. Almost every country or region traditionally had their own list of birthstones! The picture shown right is the birthstone chart many of us are most familiar with - it is the most-widely used list of birthstones across the world today and is the one standardised by what is now Jewelers of America in 1912. These gemstones are listed in the Modern Birthstones column in the chart below. But what are birthstones? They are precious or semi-precious gemstones that symbolise the month we were born, and have been popular since the 15th or 16th century - the birthstones listed in the Traditional Birthstones column below all date from this period. But I digress! As I was born in May, the table above shows that both my Modern and Traditional birthstone is the Emerald, although if I had lived in Hebrew times or had practised Ayurvedic Indian medicine, it would have been an Agate. And my Mystical Tibetan birthstone is a Sapphire, which is jolly nice, as I adore sapphires! With such a bewildering choice available, it would seem that you could choose just about any stone you like as your birthstone. But for my birthday on 19th May, I'd like an emerald, a sapphire, a citrine or a ruby please!!! Make mine diamonds, emeralds and sapphires, please. Notice the plural! Nice post. Aquamarine - lovely! Great to know we can have our choice of gemstones! Thanks for this very interesting, insightful post. Very handy to have, Erika. This is Awesome! Great info. Very informative. Great blog post. Nice to see I have some alternatives to my traditional birthstone!